There are a number of ways to log data from your course or study to DataShop. Important factors for selecting a method are the stage and technology of the tutoring system implementation. We'll examine a variety of cases in detail below, including each of their requirements and benefits. The definitive reference for the logging format accepted by DataShop is the Guide to the Tutor Message format. This guide is intended primarily for software developers who to want implement logging in an educational tutoring application, or convert existing logs created by a tutoring application. Prior to logging data, you may want to reserve the dataset and assign it to a project so that you can view your data without our assistance. Otherwise, you will need to contact us to obtain access to the data after logging begins. 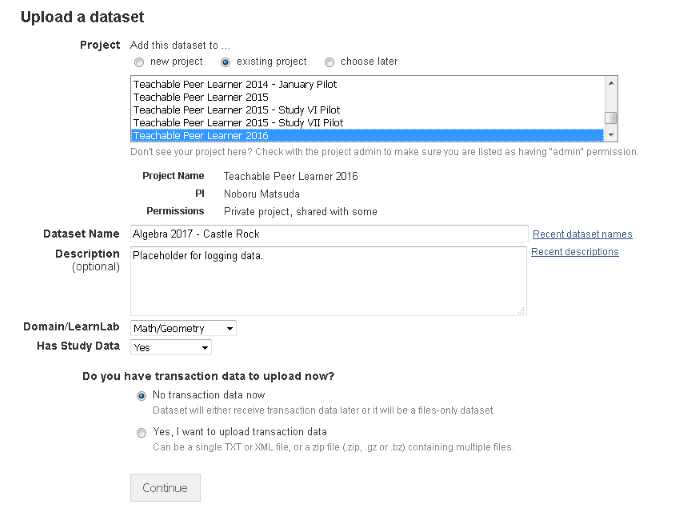 You can create a "placeholder" (or files-only) dataset for one of your projects by visiting the Upload a dataset page. Choose the project or create a new one, and elect for "No transaction data now". After the dataset is created, you can access the data as it becomes available from the logging servers. Tutors or applications logging to DataShop should use one of the following URLs based on the status of data collection and the study in general. See the log conversion schedule for exact log conversion times. If you don't see your data, please contact us. Any tutor created with the Cognitive Tutor Authoring Tools (CTAT) or Open Learning Initiative's (OLI) tools has logging functionality built-in. Information on configuring logging in these tools can be found here. If you are creating a Java tutor or educational application and would like to log to DataShop, download and use the existing logging library. The Java logging library includes well-documented APIs and sample applications for learning to integrate logging functionality into your application. Also see the Guide to the Tutor Message format for more on the logging format produced by the logging libraries. Carnegie Learning provides logging of tutors deployed in their curriculum management system. To view these logs in DataShop, the logs must first be harvested from the local machines used in the study. As honest broker, Carnegie Learning then anonymizes the data and provides DataShop with converted logs. If you are running a study involving Carnegie Learning tutors and you would like to use DataShop, please contact us and inform us of the location of the study, who's involved, and the timing of the study. Early notice is appreciated. An existing project with sufficient technical resources may be best suited to implementing logging in a different language. If so, developers should consult the Guide to the Tutor Message format. In this case, the tutor should write log data to files, and the files can be zipped and sent to us. Note: DataShop currently supports versions 2 and 4 of the logging format. Sample Selector is a tool for creating and editing samples, or groups of data you compare across—they're not "samples" in the statistical sense, but more like filters. By default, a single sample exists: "All Data". With the Sample Selector, you can create new samples to organize your data. A sample is composed of one or more filters, specific conditions that narrow down your sample. View the sample preview table to see the effect of adding your filter, making sure you don't have an empty set (ie, a filter or combination of filters that exclude all transactions). DataShop interprets each filter after the first as an additional restriction on the data that is included in the sample. This is also known as a logical "AND". You can see the results of multiple filters in the sample preview as soon as all filters are "saved".